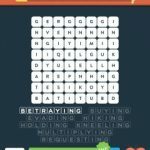 Stuck in Wordbrain 2 Verbs That End With ‘ING’ (Word Commander 8×8). Here are the answers. Level 3 – admiring, changing, digging, flying, hovering, judging, mailing, photographing. Level 3 admiring, changing, digging, flying, hovering, judging, mailing, photographing.